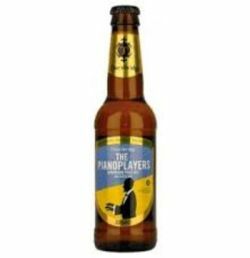 The Pianoplayers is a fruity and fresh American Pale Ale brewed with Amarillo, Mosaic & Simcoe. It offers a pungent combination of intense citrus and tropical fruit aromas of passionfruit, apricots, papaya and red berries. Pours a bit hazy yellow, topped with a thin white head. Very nice citrusy nose with grapefruit and some pineapple. Moderate bitterness with slight citrusy touch. Drier finish and lasting aftertaste. Light and fresh body. Very fine. UPDATED: JAN 28, 2018 strong aroma, clean Taste, less hoppy more malty, Close to pils, high drinkability. Bottled 330ml. -from Pivoljub Ljubljana. Yellow coloured, small white head, mild citrusy nose. Citrusy, light herbal hoppy, notes of elderflower and grapefruit with rather watery palate. Some discreet bitterness in the finish. Bit thin but ok. Pale, tight head. Light fruity aroma. Thin malty taste, some dry bitter bite. Slight harsh palate. Watery and fizzy. Meh. Bottle, 330 ml from Pivoljub. shared with JFK10000. Clear golden, small white head. Hoppy, grassy, some cats piss, light bodied. Light bodied. Bland. Expected more. UPDATED: SEP 10, 2017 33cl bottle picked up at the brewery taproom and poured into a snifter on 20-Sep-2017. Hazy straw coloured with a small white head. Aroma of citrus, yeast and funk. Light to medium body and carbonation. Taste of grapefruit, passionfruit, mango, apricot, lemon and hops. The lemon dominates. Slightly bitter with a fruity dry finish. 33cl bottle from Cotteridge Wines. Poured a hazy straw colour with a thin broken white head. The aroma is grassy hop, citrus. The flavour is moderate to light bitter with a light, slightly watery, grassy, weedy citrus fruit hop bitter palate. Medium to light bodied with average carbonation.